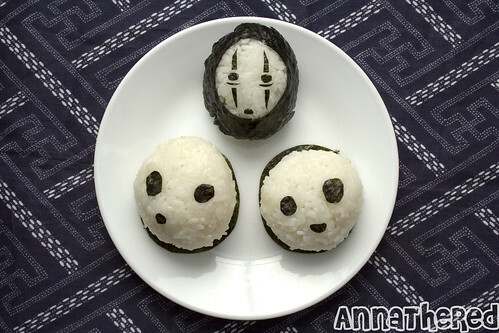 Posted by AnnaTheRed in bento blog (all), how-to - characters (Ghibli, video game, Wall-E). 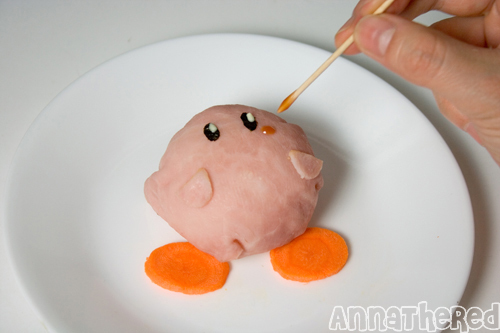 I’m pretty surprised that “how to make radish mushroom / Mario mushroom” got so much attention in the past couple of days. 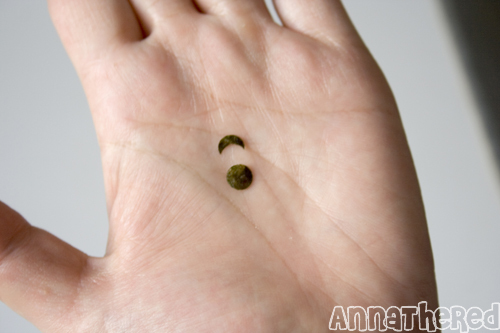 Especially because when I did the how-to, my main focus was just a regular mushroom. I thought a regular mushroom would be more useful for regular kyaraben, and the Mario mushroom was just spur of the moment kind of thing. I ended up using the picture of Mario mushroom for the main picture of the set because, well, it looked cute. 😛 If I had used the picture of the regular radish mushroom, it probably wouldn’t have spread everywhere like this. 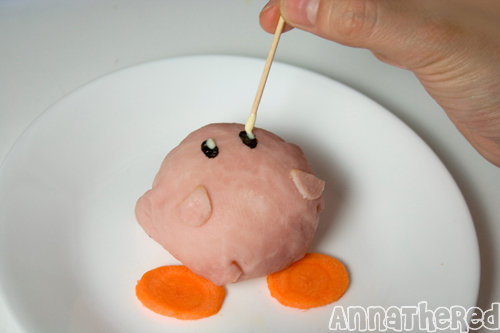 Anyway, the whole radish Mario mushroom thing reminded me that I haven’t done a how-to in a while. 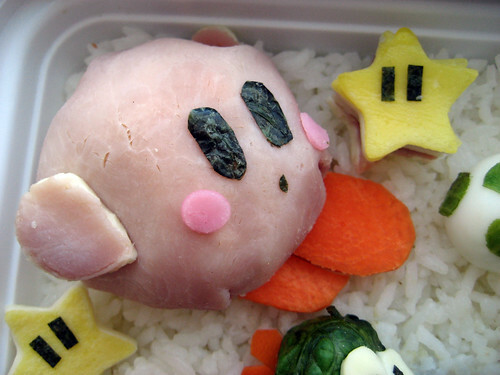 So I was going through my old bento photos, and saw a character that would be easy to make and nerdy at the same time. 2. 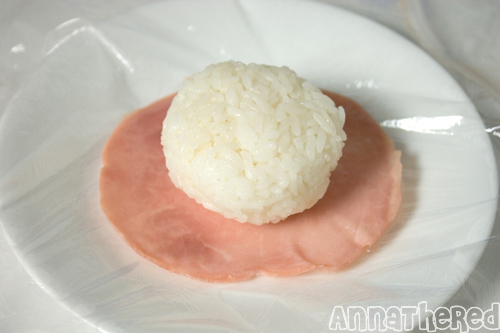 Put ham on a plastic wrap, and put the rice ball in the center of the ham. 3. 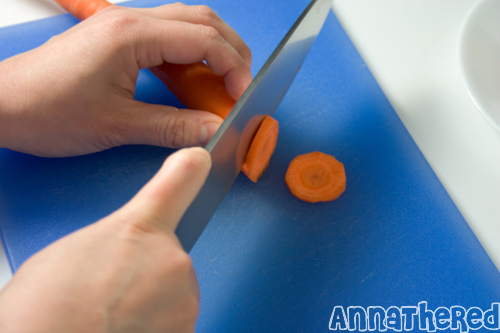 Pull the plastic sheet together, and wrap it tight. 5. 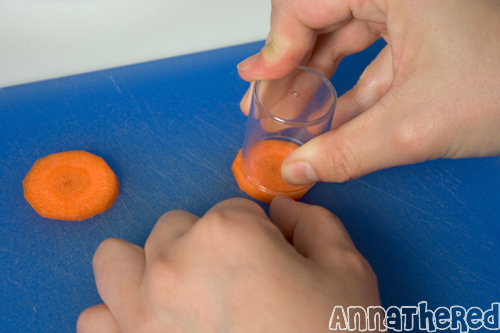 Cut ham for his arms with a plastic bottle cap. 6. 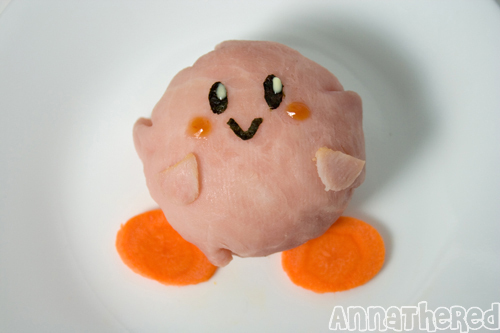 Cut out seaweed for Kirby’s eyes. *You can put cheese or mayonnaise on the tip of a tooth pick and put it on the eyes for the sparkle and ketchup for his pinkish cheek, but this is optional. 7. 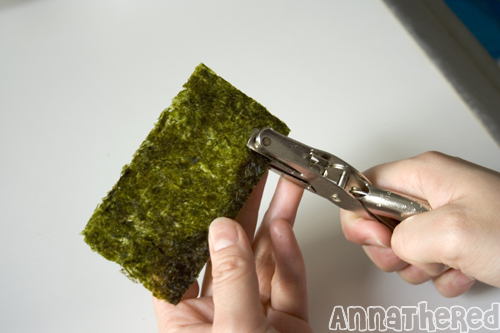 Cut out seaweed for Kirby’s mouth. A different shape for a different facial expression! 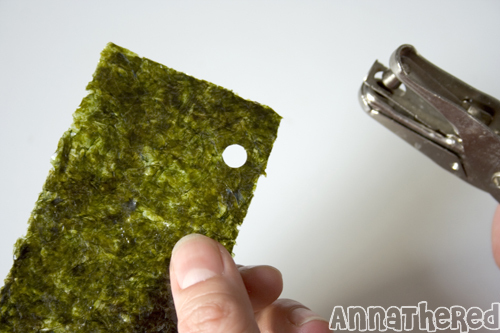 For “Super Smash Bros. Brawl bento”, I just cut a small piece of seaweed. 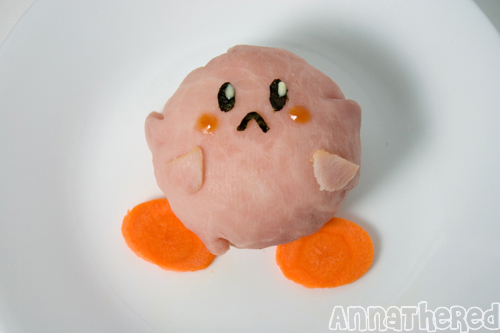 I used the pink part of kamaboko (fish cake) for his cheeks on this one. 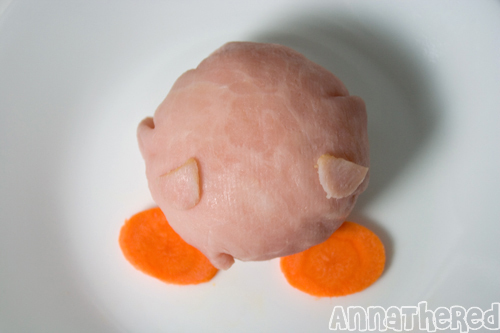 Now it's your turn to eat him! 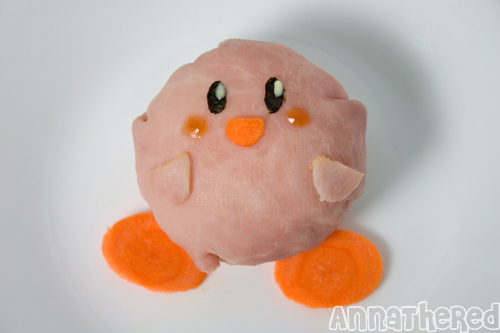 If you’re just making a rice ball and not putting him into a bento box, you can keep him wrapped in plastic wrap and skip the carrot feet, sparkle and cheeks. My boyfriend and I are on the road again! We’ve been trying to empty the fridge, so I’ve been making regular bento. 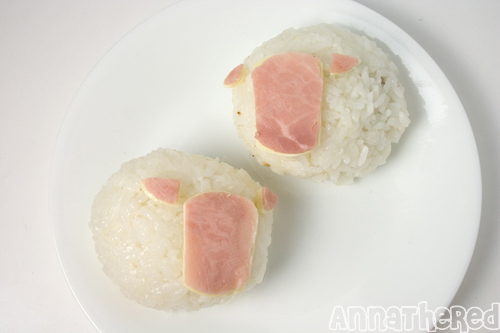 But I still wanted to make a kyaraben-ish thing, so I decided to make breakfast. Since we moved to the new office, we’ve been trying to find a good deli to get breakfast. But since our new office is closer to the big subway hub, it’s either expensive or they don’t care enough to make decent bagel (for my boyfriend) or coffee (for me) because they get so much traffic. So I’ve been trying to make breakfast for us in the morning, but it hasn’t been easy. If I’m making a regular bento, I have no time for making breakfast. 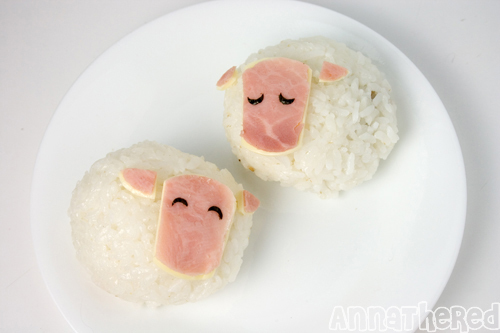 If I’m making a kyaraben, I have nooooooo time for making breakfast. 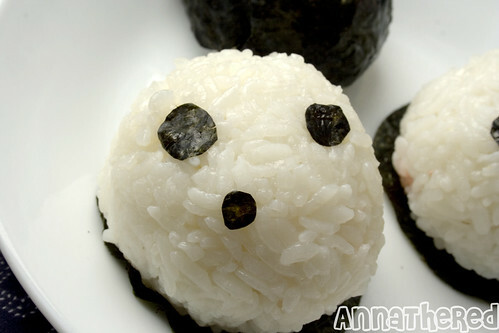 If I, miraculously had time to make it, I’d make rice balls like Doraemon rice balls. 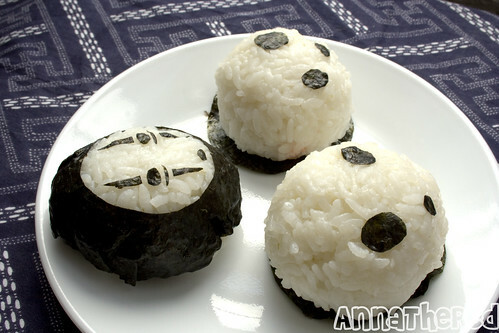 Doraemon rice balls were so easy, but these ones were even easier. 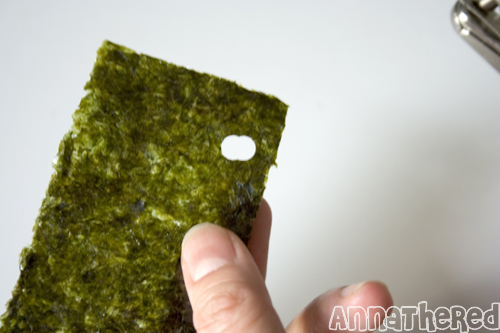 I was thinking about what I could make with rice and seaweed, and I couldn’t believe I didn’t think of making this before. Kaonashi and Kodama! Not sure if I need to explain how I made it, but I’ll do it anyway. 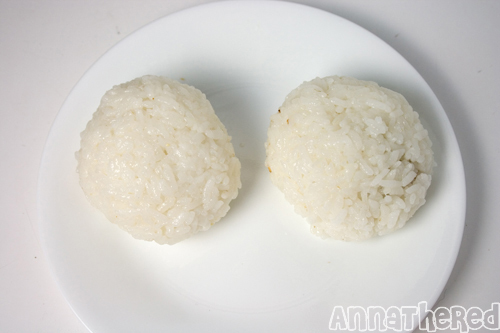 I made three small rice balls with plain rice with salt, and put microwaved tarako (cod roe) inside. 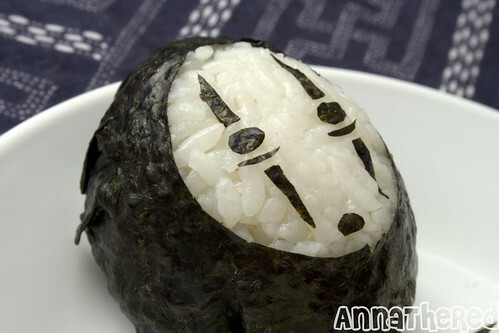 Then I cut a hole in the seaweed and put it over one of the rice balls for Kaonashi. I cut seaweed for for his eyes and the patterns on his face. 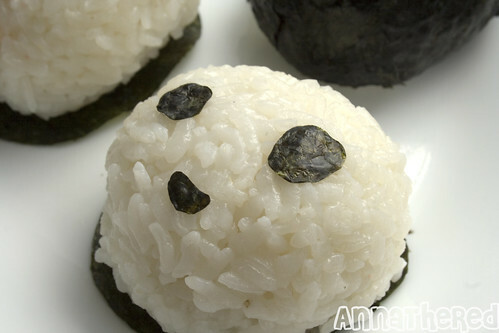 For Kodama, I cut seaweed into circle-ish shape and put them onto other rice balls. 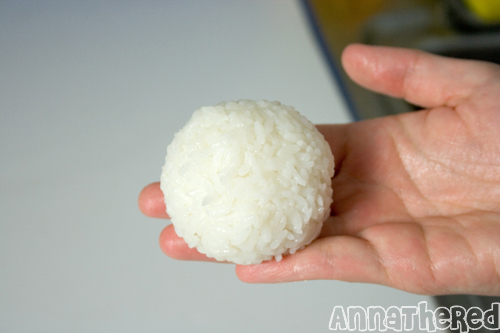 If you have access to sticky rice, this is probably the easiest kyaraben for a kyaraben beginner. You can definitely do this with white bread too.